To celebrate Valentine’s Day, Starbucks is offering B1G1 FREE Lattes! 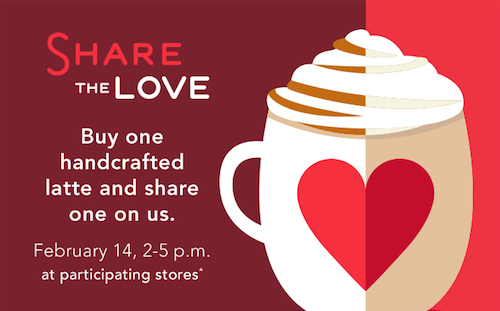 Just stop in anytime between 2 and 5 pm today, 2/14, and you’ll get a FREE latte with the purchase of one. This is a great way to have an inexpensive coffee date with a friend or loved one! It would be a great way to catch up with someone over coffee as well. Their new Caramel Flan Latte sounds delicious! Has anyone had a chance to try it out yet? Includes any handcrafted espresso or tea latte. Good at participating Starbucks stores.